The Nesco VS-12 Deluxe Vacuum Sealer provides the ability to choose what settings work best for the food you are sealing. The pulse vacuum option is great for sealing delicate items like buns and bakery. Simply press the manual seal button to double seal when you have reached the desired vacuum level. The Vacuum Sealer features a double vacuum pump for optimal performance and double line seals for added strength. Clear viewing window in lid and tab guides for better bag material positioning and sealing. Also has a bag roll storage compartment and a bag cutter. It can accommodate up to an 11.8" wide bag or roll. 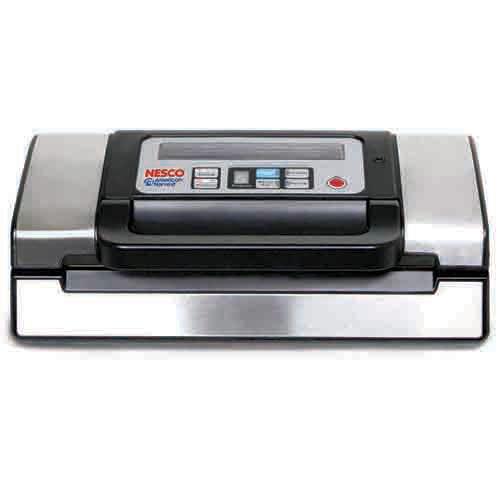 The Nesco Deluxe Vacuum Sealer has many exciting features for users of all types. You can extend the lifetime of your Nesco Deluxe Vacuum Sealer with the purchase of a FactoryOutletStore Factory Protection Plan. See the Nesco Deluxe Vacuum Sealer gallery images above for more product views. 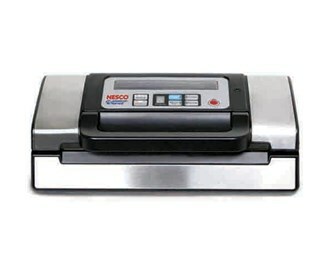 The Nesco Deluxe Vacuum Sealer is sold as a Brand New Unopened Item.